Vast inequalities exist within societies as well as across nations. Understanding the causes of inequality is a research question dating back to the foundations of economics as a discipline, as well as the topic of urgent policy debates today (Smith 1776, Acemoglu and Robinson 2012, Piketty 2014, Atkinson 2015). Traditionally, economists have focused on factors such as geography (Sachs 2003) or institutions (Acemoglu et al. 2001) as determinants of inequality. Another line of research, however, has explored the idea that societies might behave differently even given the same geographic and institutional endowments due to differences in culture, broadly defined. The importance of culture for economic development was famously hypothesised by the sociologist Weber (1930) but has also received modern restatements (e.g. Landes 1998, Francois and Zabojnik 2005), and increasing attention from economists in recent years. Aspects of culture that have been studied empirically by economists include cultural norms about parent-child living arrangements, fertility, female labour force participation, and values such as future orientation (e.g. Giuliano 2007, Fernandez and Fogli 2009, Alesina et al. 2013, Galor and Özak 2016). In a recent paper, we develop a new dataset – the Global Preferences Survey (GPS) – and provide novel results about a key dimension of cultural variation that has not been studied on a global scale with representative samples, namely, fundamental economic preferences (Falk et al. 2018). In economic theory, preferences are the drivers of how people choose, subject to constraints, and therefore cultural differences might be understood as partly reflecting differences in preferences. While economic theory abstracts away from many aspects of these, certain preferences – for example, those over risk, time, and various social preferences – are explicitly modelled because they are relevant for almost all economic decisions. Up until now, however, there has not been a data source measuring these fundamental traits across the globe with a consistent methodology and representative population samples. We first present descriptive statistics about the extent and nature of preference variation around the globe. Exploiting the representative sampling design of the GPS, we provide country-level averages for fundamental economic preferences. We find that countries differ significantly in terms of average preferences, and that certain preference combinations are particularly pronounced in some regions of the world. 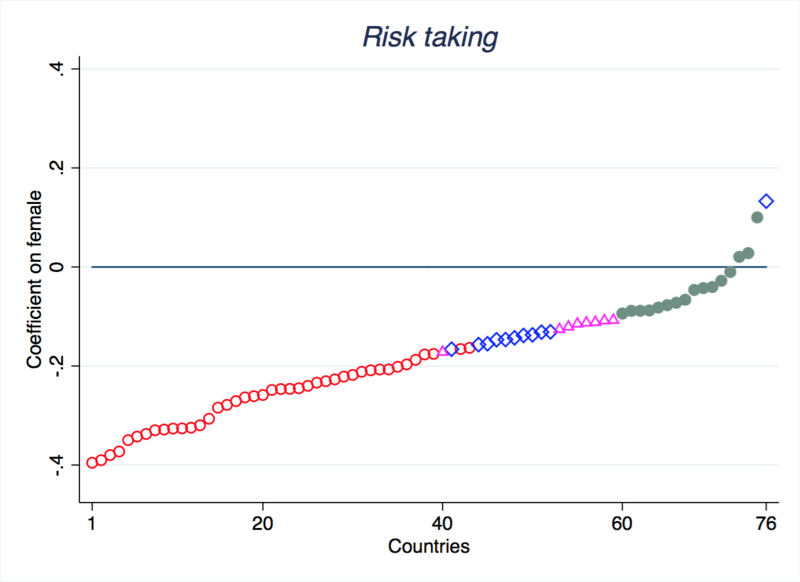 For example, the most patient countries in the world are in Western Europe, Scandinavia, and English-speaking countries, whereas the greatest willingness to take risks is found in countries located in sub-Saharan Africa (Figure 1). There is even greater variation in preferences within countries than across countries, however, so national borders are relatively less important for preference differences than individual heterogeneity. Having found evidence of preference variation within and across countries, we explore potential determinants of preference differences, beginning with how preferences are related to individual-level characteristics – gender, age, and a proxy for cognitive ability. The GPS allows for studying these relationships in 76 different countries on a representative basis, and therefore can shed light on whether, for example, a gender difference in a given preference is relatively universal across cultures, or whether it is more culturally specific. 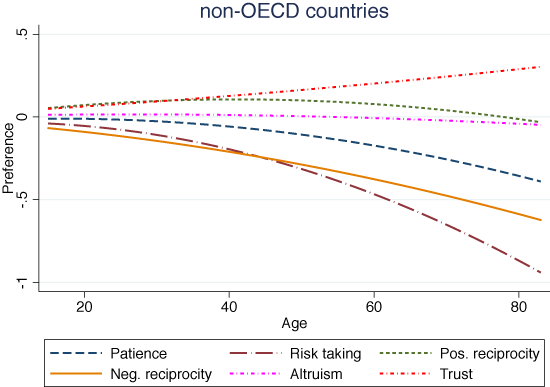 Some notable findings include the fact that men are more prone to take risks than women in almost all countries, whereas age profiles in patience are different across countries, with a hump shape for OECD countries but a linear relationship for non-OECD countries (Figure 2). 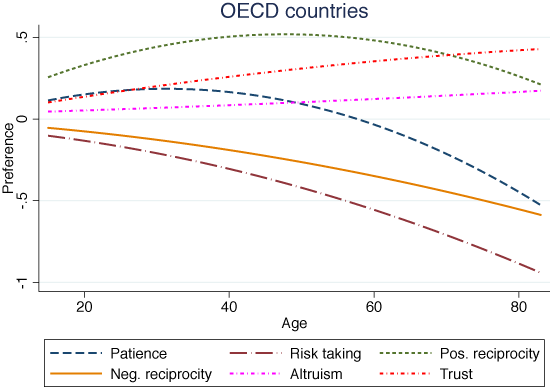 The proxy for cognitive skills is associated with greater patience and greater willingness to take risks in almost all countries. Our research also studies the relationship between preferences and potential country-level determinants of preference differences, in terms of geography, agricultural suitability, language, and cultural values, which have been hypothesised previously to play a potential role in shaping preferences. For example, patience, trust, and negative reciprocity are all significantly positively correlated with distance from the equator, and are more pronounced in regions believed to have had larger numbers of species of domesticable animals in prehistoric periods. The latter result is broadly in line with the ‘culture of honour’ hypothesis, in which herding cultures have a stronger incentive to develop a culture of retaliating against wrongdoing (Nisbett and Cohen 1996). Another finding is that weak future time reference, a linguistic feature that entails a weaker distinction between present and future tense, is associated with greater patience. This is in line with the ‘savings linguistics’ hypothesis of Chen (2013), in which the structure of language may shape preferences. Examining the correlation of preferences with other cultural variables, patience is strongly and significantly correlated with a set of variables that may be summarised under the umbrella of Weber’s ‘spirit of capitalism’ – Protestantism and various measures of individualism. Turning to the relationship between preferences and economic outcomes, we select types of individual-level outcomes that have been hypothesised to depend on certain preferences. There are many factors other than preferences that might drive variation in such outcomes, so it is not obvious that the hypotheses will be supported. We find, however, that preference differences are important for explaining differences in economic outcomes. For example, savings and education are significantly related to patience, and outcomes such as self-employment and smoking are related to risk preference. Furthermore, the prosocial traits of altruism and positive reciprocity are related to volunteering, donation behaviour, and number of close friends. Importantly, we find similar qualitative results in almost all of the 76 countries. This indicates that the GPS preference measures are capturing similar traits across a wide variety of cultures, and supports the view that variation in the fundamental preferences identified in economic theory may help explain inequality in important types of outcomes within societies. Differences in preferences across countries might also have implications for explaining differences in aggregate level outcomes. 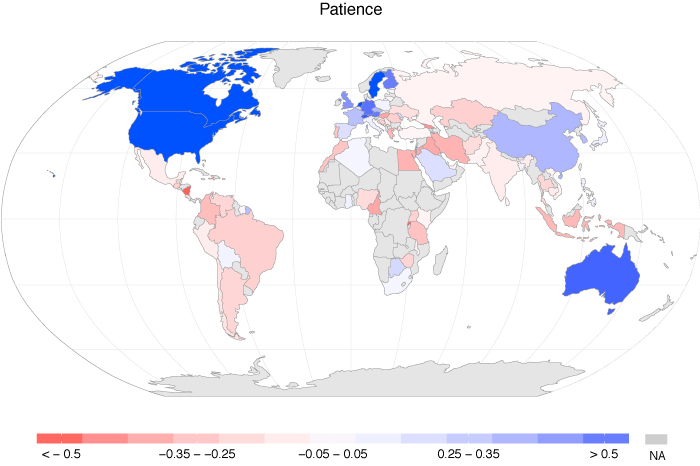 We find that differences in GDP per capita across countries are strongly correlated with differences in patience. This is in line with standard growth models in which time preference drives accumulation decisions at the individual level and growth at the aggregate level. 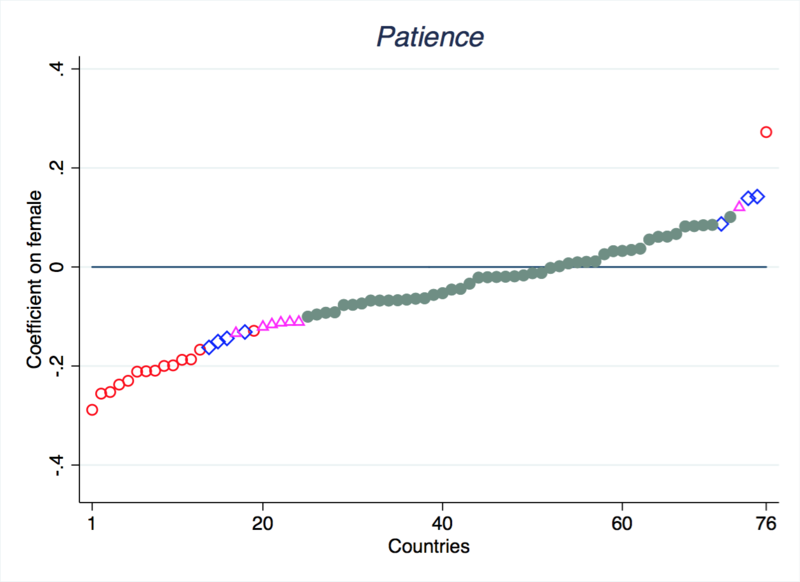 Interestingly, trust, which has been found in previous research to be positively related to GDP per capita, has a much weaker relationship to standard of living once patience is taken into account. 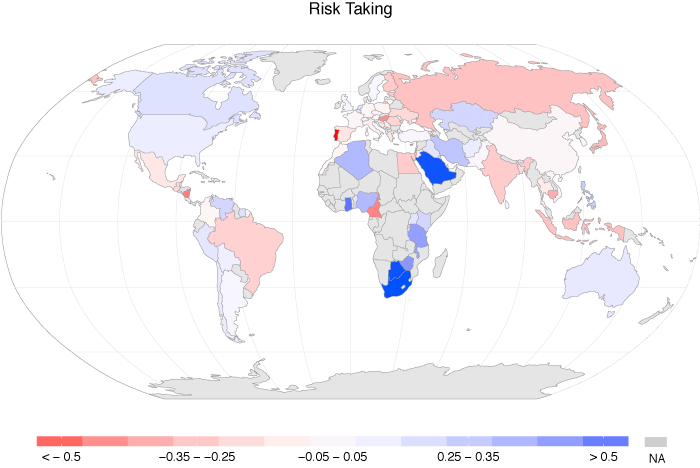 Risk preference is positively correlated with some measures of entrepreneurial activity, and prosocial traits with charitable activities as a fraction of GDP. The degree of negative reciprocity within a country is positively correlated with the frequency of armed conflicts. In summary, our analysis of the GPS data sheds some first light on how fundamental economic preferences vary around the globe, with implications for understanding inequality. Preferences vary substantially across and within societies, and these differences are related to differences in economic outcomes, at the individual and aggregate levels. Notably, the quantitative importance of preferences for explaining outcomes is in some cases substantial. For example, in our analysis the GPS patience measure explains a larger portion of the variation in GDP per capita than any of the standard geographic variables used in the growth literature. This does not mean that factors such as geography and institutions do not also matter for inequality. Indeed, it could be that geography and institutions play some role in shaping preferences, and this could be a channel through which these matter for outcomes. A role for preference differences in explaining inequality has implications for economic theory and also policy. The traditional approach in economic theory has been to treat preference differences as a black box, and effectively randomly determined. Our findings add to accumulating evidence that preference variation is instead systematic, related to both individual traits as well as characteristics of country and culture. This underlines the value of recent theoretical and empirical work on preference formation, for example in the form of parents striving to shape the preferences of their children (Bisin and Verdier 2000, Dohmen et al. 2011, Doepke and Zilibotti 2014). In terms of policy implications, our findings suggest that institutional reform should take into account how institutions may interact with preference differences – the same legal institution, for example, may have different effects in different populations depending on the distribution of preferences, and such institutions might also shape preferences in the long run. The results also highlight the importance of research on how policy interventions may shape preferences, for example through interventions in early childhood (e.g. Heckman 2006, Kosse et al. 2017). Editors' note: For more information on the Global Preferences Survey, visit the website here. Acemoglu, D, S Johnson, and J A Robinson (2001), “The colonial origins of comparative development: An empirical investigation”, American Economic Review, 91 (5), 1369-1401. Bisin, A, and T Verdier (2000), “’Beyond the melting pot’: Cultural transmission, marriage, and the evolution of ethnic and religious traits”, The Quarterly Journal of Economics 115(3), 955-988. Chen, M K (2013), “The effect of language on economic behavior: Evidence from savings rates, health behaviors, and retirement assets”, American Economic Review 103 (2), 690–731. Doepke, M, and F Zilibotti (2014), “Culture, Entrepreneurship, and Growth”, in P Aghion and S Durlauf (eds. ), Handbook of Economic Growth, Vol. 2A, Amsterdam: Elsevier. Dohmen, T, A Falk, D B Huffman, and U Sunde (2011), “The intergenerational transmission of risk and trust attitudes”, The Review of Economic Studies, 79 (2), 645-677. Falk, A, A Becker, T Dohmen, D B Huffman, and U Sunde (2016), “The preference survey module: A validated instrument for measuring risk, time, and social preferences”, IZA Discussion Paper no. 9674. Falk, A, A Becker, T Dohmen, B Enke, D B Huffman, and U Sunde (2018), “Global evidence on economic preferences”, Quarterly Journal of Economics (forthcoming). Fernandez, R, and A Fogli (2009), “Culture: An Empirical Investigation of Beliefs, Work, and Fertility”, American Economic Journal: Macroeconomics 1 (1), 146-177. Francois, P, and J Zabojnik (2005), “Trust, social capital, and economic development”, Journal of the European Economic Association 3 (1), 51-94. Galor, O, and Ö Özak (2016), “The agricultural origins of time preference”, American Economic Review 106 (10), 3064–3103. Heckman, J J (2006), “Skill formation and the economics of investing in disadvantaged children”, Science 312(5782), 1900-1902. Kosse, F, T Deckers, H Schildberg-Hörisch, and A Falk (2017), “The formation of prosociality: Causal evidence on the role of social environment”, IZA Discussion Paper no. 9861. Landes, D S (1998), The wealth and poverty of nations: Why are some so rich and others so poor?, W.W. Norton. Nisbett, R E ,and D Cohen (1996), Culture of honor: The psychology of violence in the South, Westview Press. Sachs, J D (2003), “Institutions don’t rule: Direct effects of geography on per capita income”, NBER working paper 9490. Smith, A (1776), An inquiry into the nature and causes of the wealth of nations, London: W. Strahan and T. Cadell. Weber, M (1930), The Protestant ethic and the spirit of capitalism, New York: Scribner's. The data from the GPS are accessible online at https://gps.briq-institute.org.